Fronted by singer/songwriter and guitarist Darren Hodson, The Southern Companion is the pseudonym for a collective of some of the UK’s most passionate and talented musicians in their genre. 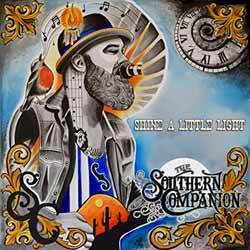 There’s no doubting that the band's real passion, is in authentic Country and Americana, and their new album, Shine a Little Light proves this.. It's pretty clear that Southern Companion's Darren Hodson is not just a fan of Country and Americana music, he's pretty much an expert on the nuances that define what makes a memorable song in that field. Over the course of this album's 11 songs (41 min, 50 sec) he expertly delivers tracks that will be embraced by County fans, as well as those who normally shy away from the genre. The end result is a collection of indie, rock-infused tracks with an Americana feel. There isn't a dull song on the entire album and each could easily be released as a single in its own right. It's also a timeless release. Each track could have been released decades ago or years from now and not feel out of place or time. An outstanding, diverse and engaging release.